How can I access technical support for Sunshine Classics? Students can work offline using their own devices. If they bring them to school, they can download e-books to work offline later, so long as they do not log out of the app. Their data will be saved the next time they connect to the internet. Why does the recording activity sometimes not include the whole story? The texts used in the recording are limited to around 120 words. This is to save memory on devices. Why can’t I see how many times a student has done an activity? All of the activities are overwritten if they are saved again. My students have difficulty remembering their log in details. We suggest that you adopt a single password for your school and only have individualised usernames. As long as the username is a word that is intuitive for the student (e.g. their first name plus numbers), the password can be remembered by the device and the student needs only replace the username to login. Can I have a printed list of students and their details? You can access and print student details using the Print Class List button. The Admin can access all student details using the Print All Current Classes button. What happens if the administrator is also a class teacher? If you are the Administrator and need to set yourself up as a class teacher, we suggest you use a made-up email address for yourself (it does not have to be a valid email). This is because the email address for the Administrator cannot also be used for a teacher. As the Admin, you can now access all classes including your own. I can’t find the students’ names that I have loaded. To achieve a bulk upload, you need to include all students’ details, the teachers’ email addresses and the class names on an Excel file. This file must be configured so that columns are named in order from left to right – First Name, Last Name, User Name, Password, Role, Class. Once the Excel file is ready, Save As a csv file (comma separated values). Each student needs a unique username and the school password. Role specifies whether the entry is a student or teacher. The teacher’s username must be his/her email address (unless the teacher is also the Admin person). How can I use an interactive whiteboard to project the books? The simplest way is to set up a separate student account just for the whiteboard. You can then allocate the stories and activities you want to use on the whiteboard, and project the books through the iPad or other device. You cannot use the programme satisfactorily from your teacher account as that does not allow full interaction with the activities. Why is there no voiceover after level 5? There is voiceover for all the e-books, however, at levels 6–19, there is no sound icon. To hear the text read, just tap or click on the paragraph. How can I change a student’s username? Select the class the student is in, select the student and then select Edit/Transfer Student from the bottom navigation bar. There you can edit their details, transfer them from a group or a class, or delete them. Why doesn’t the login I got in the activation email work when I downloaded the app? The login details that you received in the Sunshine Classics activation email enable you to login as the Administrator of the account. The app is for the student login. Why do I get a blank screen when I log in? Because Sunshine Classics is created in HTML5 to work on computers and tablets, you need to ensure that you have the latest version of your browser. Many schools may be using older browsers such as Internet Explorer 7, 8 or 9. We suggest that you use Google Chrome as your browser for Sunshine Classics. Our school doesn’t have iPads so does that mean we can’t use Sunshine Classics? Sunshine Classics is totally browser-based and will work on your desktop and laptops without any problem. A free app has been developed so that students can use the program on a touch screen (iPad or Android tablet). This way the student experience can be more portable at school and at home. The free app functions the same way as the program does through a browser except that you have touch screen on the tablet and use your cursor on the browser. Go to this link: At the bottom of the screen, you will see a link Template for bulk import (.csv) as shown here. When you download the .csv file, you will see that it already has headings across the top as a guide. Leave these headings as they are and fill the file in accordingly from the first blank row. Note that the word Role is where you add either Student or Teacher. Why do I get error messages when I try to bulk import using the template? If you get an error message when trying to set up your school using the bulk import template, click the Print Errors button. This should give a list of all the entries that need correcting. Go back to the .csv file and make the corrections (the most common problem is that the username already exists). Import the file again until there are no errors. If Sunshine Classics is behaving very slowly, a good thing to check is your internet speed as this can affect how well online programs act on screen. Use this link to access an automated website that will show you your computer’s internet speed. (Don’t worry, it won’t access anything on your computer or make any changes, it will simply display your settings). Click the green “Begin Test” button and the on-screen dial will test your upload speed (sending data from your computer) and download speed (receiving data to your computer). Giving your internet speed to our technical support team will help them diagnose your problem. How can I see what my computer's settings are? How do I clear my internet history and cache? Your browser will “remember” the web pages you have visited, in order give you a faster viewing experience online. Often, after an update of Sunshine Classics, you may need to clear your “cache” (your computer’s memory of websites you’ve visited) in order to load the newest version of the website. Read below to find out more. Every now and then you may need to clear your computer’s cache. This page will explain what that’s all about, why it’s important and how you can go about doing it. What is my cache? Most websites you visit are actually a composition of dozens, hundreds or even thousands of files. Even simple websites may be loading lots of files at once to display content. Your browser will do their part to speed up the loading process, by “saving” pieces of the website in its “cache” the first time you visit. In future visits, your browser can then load the page much faster. This is also called your computer’s temporary internet history. Sounds sensible. So why would I want to clear cache? Occasionally, websites make updates to the files that comprise the site in order to release a change or make a new feature live. If your browser is still loading its “old” saved files from it’s cache you won’t see our most recent change. That’s why we ask you to clear your cache. although the method will vary dependant on which browser you are using. Click below for instructions for the browser you are using (please note – dependant on the version of your browser, these methods may vary slightly). Click the Tools menu top right. It will look like a gear icon. Click the Firefox button at the top of the screen and select “Options”. Click on the Advanced panel. In the “Cached Web Content” section, click Clear Now, followed by OK. In the box that appears, select the boxes for the types of information to remove. Recommended: select the timeframe “Beginning of time” to delete all temporary files. Click the Safari menu on the top left of your screen. Click on preferences and advanced tab. Tick show develop menu in menu bar and close. Go to top menu and select Develop and clear cache. Some elements of Sunshine Classics, use Java – a piece of software that enables us to deliver rich and dynamic content online. Most modern computers, both PC & Mac, will come with some form of Java software installed – meaning users will be able to access Sunshine Classics without any problem at all. However, it is important to check you have Java installed (and the most up to date version) or you may not be able to access Sunshine Classics. No problem. Simply click the button below and your browser will tell you which version of Java (if any) you have. 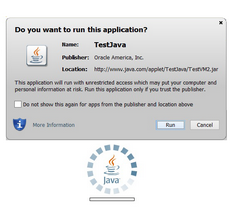 You will receive a pop-up message (as shown left) followed by a message telling you your Java status. If required, you will also be able to download (for free) the most up to date version of Java to your computer. Note: you may require the assistance of the IT Administrator/Support Manager if attempting this from within a school network. If accessing via a network, or school-based system, the proxy/content filtering systems may need to be updated to include the appropriate IP addresses for Sunshine Classics. We recommend a broadband connection. Min requirement 2Mb/s Download speed is determined by available bandwidth. Sunshine Classics can be accessed via a web browser (for desktop/laptop) and via an app (for tablets). Administrator and teacher access to the management system is via web browser. • Sunshine Classics is built in HTML 5 and any browser using the site should be the most up to-date-version. Tablet screen size of 7” or larger, with a minimum usable resolution of 1024 x 600 or higher. • Content accessed via browser.